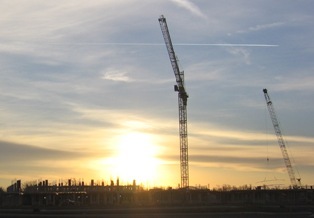 The construction at the new Middletown Regional Hospital health and technology campus is estimated to be completed in 2008. The new hospital will be located approximately a quarter mile east of Interstate 75 at the Middletown exit. Photo: A new day is dawning on Middletown Regional Hospital. The new health and technology campus will be created in three phases, with the first phase to be completed in 2008. The first phase of the 190-acre campus will include a new hospital, an attached professional office building, a cancer center and the Greentree Health Science Academy. The new facility will enable the hospital to add new programs and expand the scope and sophistication of many current services, including cardiology, trauma, oncology and surgery. Phase II may include the addition of a variety of partnerships, such as the development of a campus YMCA and new services for seniors. Phase III may include partnerships to develop a conference center and to accommodate researchers in the healthcare and medical fields.